Datamax Ribbon 229106 38mm x 360M – General Purpose Resin Enhanced Wax, recommended for use with thermal transfer labels, thermal transfer tags, matt synthetics and coated paper face stocks. 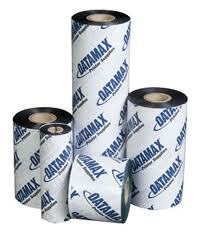 Datamax Ribbon 229119 108mm x 360M – General Purpose Resin Enhanced Wax. Recommended for use with thermal transfer labels, thermal transfer tags, matt synthetics and coated paper face stocks. For all Datamax printers except Ovation & E-Class.